This balsamic marinade is great for flavoring any type of steak and does equally well with pork or chicken. Use any dried herb blend you prefer, such as Penzy’s Bouquet Garni or McCormick’s Herb Blend. Or, if you have fresh herbs available, use ¼ cup of any combination in place of the dried herbs. For best results, cook the flank steak to medium or medium-rare, depending on your preference. Medium-well or well done generally turns out tough, dry and not enjoyable. NOTE: Marinate 6 – 24 hours ahead of cooking. Mix all marinade ingredients together in medium-sized mixing bowl. Lay flank steak flat on a cutting board. Using a fork, poke many holes all over both sides of the flank steak. This helps the marinade deeply flavor the meat. Place flank steak in large zip lock bag. Pour marinade over flank steak, coating well on both sides. Refrigerate for 6 – 24 hours, turning occasionally. Heat grill (medium-high) or broiler (450° F). 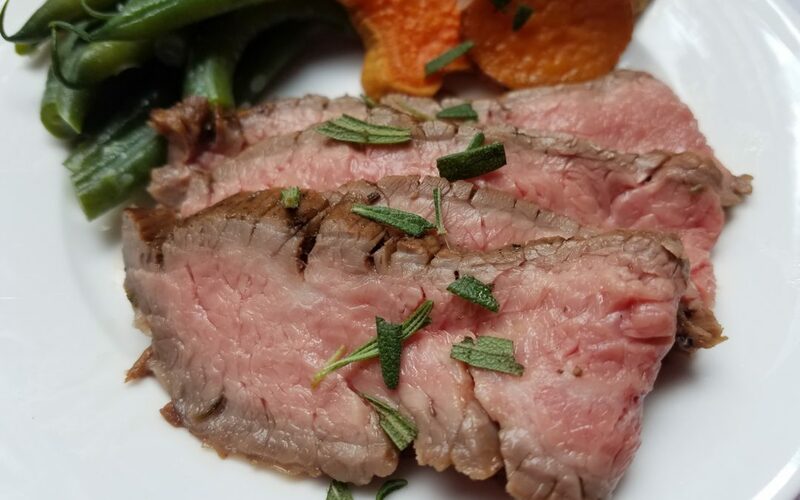 Remove flank steak from marinade and place on a platter (if grilling) or broiler pan. Discard remaining marinade. Place the flank steak on to the grill or under the broiler and cook approximately 4 – 5 minutes per side for medium-rare (130° – 135° internal temperature); 5 – 6 minutes per side for medium (135° – 140° internal temperature). Timing depends on thickness of the flank steak and may vary. Remember steak will continue to cook when resting (i.e. “carry-over cooking”). Remove from grill or broiler, transferring to a cutting board. Cover with foil and let rest for at least 5 – 8 minutes. Slice steak thinly across the grain, placing slices on to a serving platter. Serve immediately or cool, wrap and refrigerated to serve chilled at a later time.